Full color 8-bit graphics and a rugged, practical design for $50. 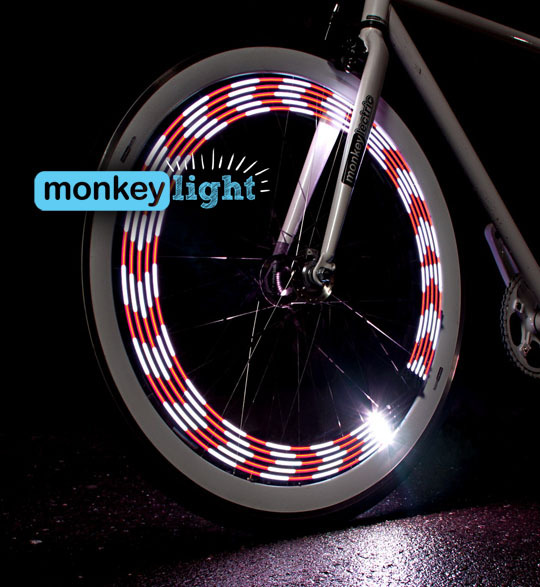 The Mini Monkey Light makes riding at night as fun as the day. 649 backers pledged $67,547 to help bring this project to life. The Mini Monkey Light is a rugged, practical, high performance bike light that keeps you visible in all weather conditions. 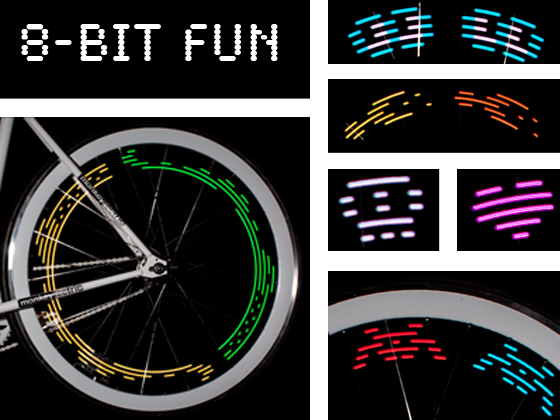 The Mini Monkey straps to your spokes and displays brilliant 8-bit graphics on your spinning bike wheel. 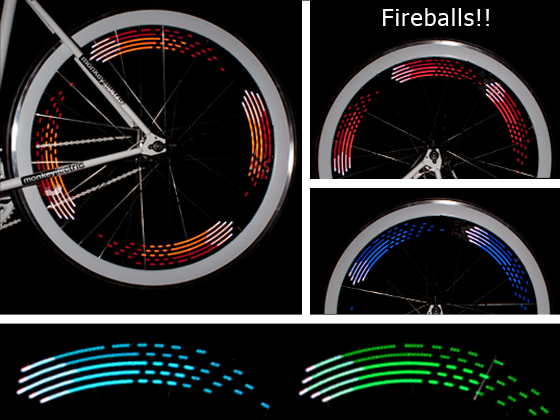 The bright and colorful display is visible from all angles, and it makes riding in the evening even more fun than the daytime. We believe that more people will consider biking for transportation if they are more confident and have more fun when they ride at night. We also believe that a practical and affordable product is critical to reaching a mass audience. Today we have completed and tested samples of the Mini Monkey Light. The product is ready for full production. We need your help so we can invest in the equipment and parts needed to mass produce. If we reach our funding goal we hope to ship the product within 3 months. FIREBALLS - SKULLS - HEARTS - SAWBLADE - ROBOTS - SPACE SHIPS AND MORE - Every Mini Monkey Light includes 15 patterns, each with many color variations. Hundreds of unique combinations are possible just by pressing the Theme and Color buttons on the light. Or you can let the Mini Monkey keep things interesting by randomly generating its own combinations.Choose the pattern and color combination to match your style. Help us choose the final set of patterns! We've come up with lots and lots of patterns, but we can only include 15 in the final product. After the Kickstarter campaign finishes, we'll make a voting form so you can help us choose the final 15 patterns. 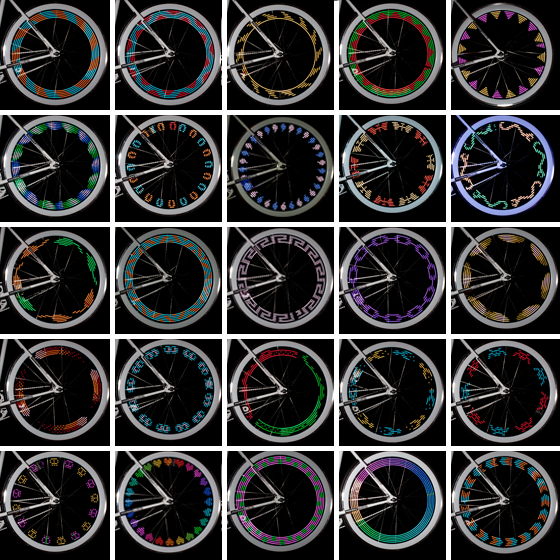 Below are some of the patterns we've made, each of which can be shown in many different color variations. If you're feeling artistic, you can also submit your own pattern idea! Tell me about the features? How do I know you guys can deliver? 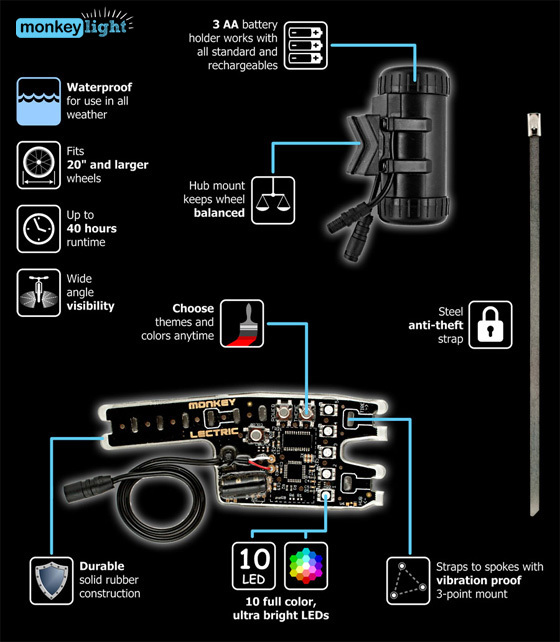 The Mini Monkey isn't just an idea, its a tested design that is production ready. Dozens of Mini Monkey test units have been getting the harshest treatment by our testers for months. We also have three years experience making our original Monkey Light M133. We've learned how to navigate manufacturing plants and supply chains, we've talked to thousands of our customers - we know the new Mini Monkey our best product yet. Come say hello to us at either the East Bay Bike Party or San Francisco Bike Party and we will give you a big hug! Get 1 Mini Monkey Light. International add $15. Get 4 Mini Monkey Lights and a MonkeyLectric T-shirt. International add $20. Get 12 Mini Monkey Lights and 3 T-shirts. International add $50. Dealer Package - Get 50 Mini-Monkey Lights in time for the Holiday season. Inquire for international shipping surcharge level. Get 50 CUSTOM Mini Monkey Lights that will display your name or message (up to 10 characters).